The yellow states were neutral territs during the war... I'll be placing something in the legend that expresses that and shows that they hold no collective bonus value. reverend_kyle wrote: what does yellow mean? Only river crossing I think would be a good idea at the moment is Mississippi & Arkansas. It still looks like the borders are pixelated, and unfortunately it would be something that would be addressed later on (in Final Forge if nothing else). Try using a 2 pixel brush instead of using a pencil to draw the lines. Other than that, I really enjoy the map, and hope it progresses quickly through the foundry! Yeah, I was going to get to that after I or cairnswk transformed WidowMaker's border pictures into a tutorial, but he may understand what you mean now. If not, check out one of the later pages of Iwo Jima, it's mostly there. you have both flags on the title and you have also placed both flags in the background. There is something in design called "overkill". This i think is perhaps an overkill to have both flags in title and in background. play around with this a little, and centre that sword under the actual title, and perhaps bring back the drums etc to each side of the title. also see what it looks like, but perhaps a drop shadow or similar on the title words. Suggestion! The legend is improving, but still need work to line everything up...you have a mixture of things happening there...some +numbers in front of text, others behind. See if you can work some consistency in there. Now...borders....try applying a guassian blur to the outlines of the borders, they are very "pixelated" and jaggered/edgy at present....perhaps could use a little "treatment" to make less jaggered...i think most punters in the foundry would prefer to see less jaggered/pixelated borders on maps. The yellow needs toning down a little also, it is very contrasting against the other colours you've used, not out of place but simply needs toning down. I quite lilke the colour scheme actually. Coleman wrote: Yeah, I was going to get to that after I or cairnswk transformed WidowMaker's border pictures into a tutorial, but he may understand what you mean now. It looks like not providing another crossing may cause play to kindof bottleneck in the north. Any thoughts? Perhaps do some research to see where the major river crossing were located, or did the soldiers simply wade through shallow river sections to get to the other side. That could also be an option...a shallow croissing on the river. -The flags at the top were replaced with the bugle and drum. -The yellow territories have been muted a little. -The swords have been centered under the title. -The Legend has been alligned so that all bonus values are along the right side. Elijah S...your new ideas topic for American Civil War has been moved into the Map Foundry, there is no need to create another topic iun the Map Foundry. Hey guys... to my knowledge I didn't create a new thread. 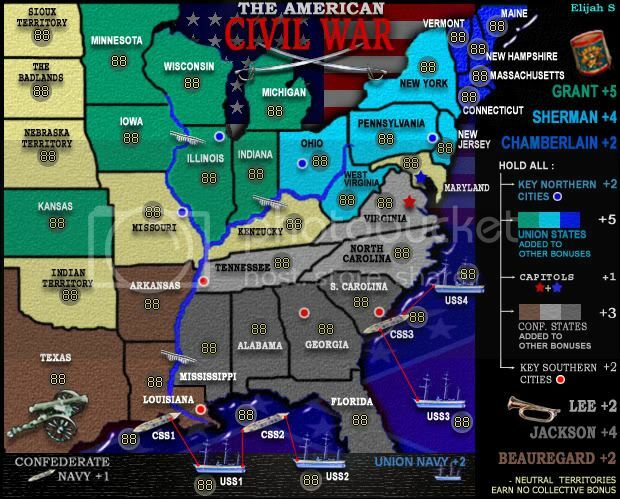 cairnswk wrote: Elijah S...your new ideas topic for American Civil War has been moved into the Map Foundry, there is no need to create another topic iun the Map Foundry. Elijah...below is what i suggest for your legend. I added 20px to the width, which is still within the absolute maximum in order to create "eyespace" for the legend. Wow... this looks much better! Thanks! cairnswk wrote: Elijah...below is what i suggest for your legend. I added 20px to the width, which is still within the absolute maximum in order to create "eyespace" for the legend. -The Legend has been made wider. Thanks for the ideas cairnswk! -The drum and bugle have been made smaller and moved to the legend area. -Some more pixelation has been tweaked. Now that you have the flags over the oceans (which looks nice) the naval ships look really awkward and out of place. Elijah...OK...your map is coming along nicely. 1. the borders around Tennessee and Kentucky are the ones that really need attending to...too jaggered, but still looking for that gaussian blur or similar. 2. a couple of the fonts in the legend appear different sizes i.e. key northern cities and key southern cities, but please check that all of them are the same each side of the legend if that's what u want. 3. Your army circles need centering where possible in the middle of the territory or as close to that as you can get it. 4. Can you investigate a way of speling out Missouri in full please, and look at some of the different sizes of text for each tert, more consistency between them sizewise would be preferred where it is possible. 5. If possible, reduce the size of the "Civil War" in the title to give a little more space between those two first lines. 6. a challenge for you...i'd prefer to see the names of those north eastern states Vermont etc spelled out in full also if possible. While I as an aussie know your states to some degree, other players from other countries might not have the same level of knowledge and this might stop them from playing the map. maybe the top of the legend will need to move down so that those names can be fit in. 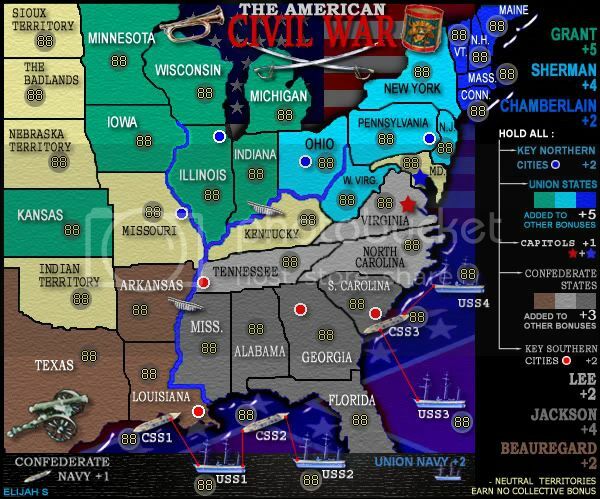 7. is there a link between alabama or florida to the css2...i think that is awkward gameplay to have a string of 4 terts off the coast like that as it gives a huge advantage to forting louisianna. think about that one. 8. there is a bit of pixelation happening on the city circles. Elijah, don't be discouraged by the number of issues that i have targeted here...my object is to make you aware of what people sometimes look for, and these fixes could make your map look so much better. It's the first time I look at this map. - You made fonts uniform and that's good, but, at least for me, font in 6th Revision was easier to read (for the size, I mean); so, I would suggest to increase a little bit font size. - In Lousiana I would invert territory name and army circle position, in order-Army circles placed more center in their territory in order to not cover Missisipi river. That observe him with familiar glances." OK...Elijah S....here's the go in the map above. 1. i have gone over your borders with a 2px pen totally black with .5 gaussiuan blur....this is what i was hoping you can achieve....please forgive some areas of smudging...but you will see that it certainly straightens those borders out and removes that jaggered look. 3. some armies could move more towards where i have the red circles. 4. there is a difference in the spacing in the legend where i have marked....you appear to have used two different fonts for the topp and bottom remarks. 5. the northern states maine to connecticut don't appear to have the same texture applied as the other states. 6. the title looks fab, as do the other things that you fixed in the 7th revision....great work! This is really improving and you are going to be so proud, as will CC....excellent work...keep it up! -Pixelation addressed... again. This time the borders have been made larger using vector lines and a slight gaussian blur. -Some army circles have been repositioned. -Legend spacing is more consistent. -A texture has been added to the blue states. 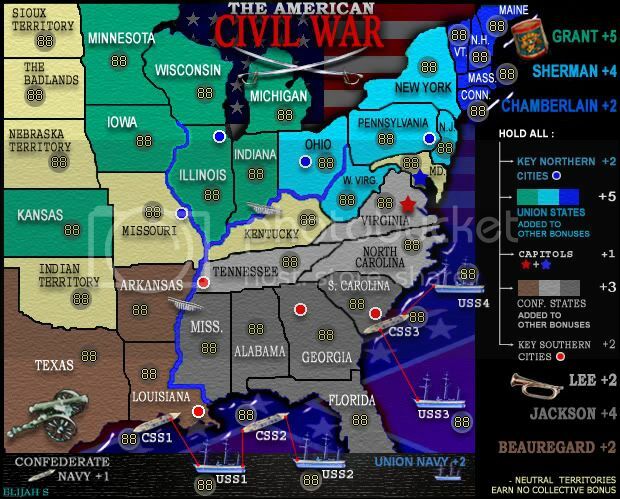 -An slight overall texture has been added to all states. -Yellow territory titles have been centered.